- Dr. Zee claims that the people of Earth are the last remaining humans in the universe. What about the people of Terra, or any number of the many colonies Galactica found in BSG 1978? 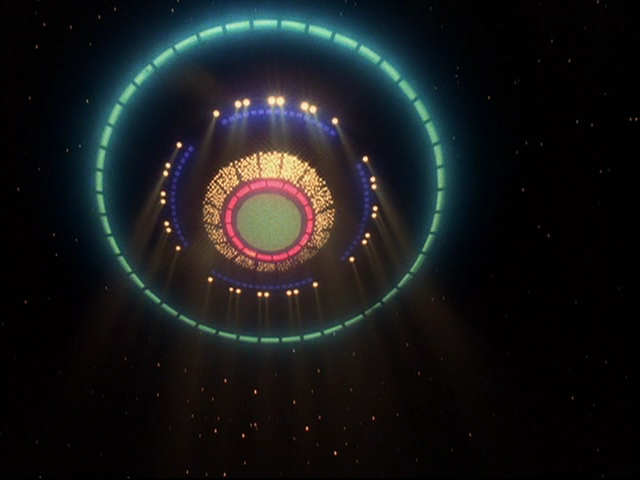 - Adama claims that Earth is the only planet in the entire galaxy capable of supporting human life. This is yet another reference to Galactica's nonsensical intergalactic travel. - So, Dr. Zee waits until they find Earth to tell everybody they've been leading the Cylons to Earth? Gee, maybe you shoulda mentioned that when you first thought of it, yes? - Dr. Zee's "computer simulation" depicting the Cylons attacking Earth is actually footage from the film "Earthquake" (1974) with Cylon fighters overlayed making it appear as though they're causing the destruction. - Troy and Dillon encountering the U.S. fighters. - The little boy discovering the Viper. 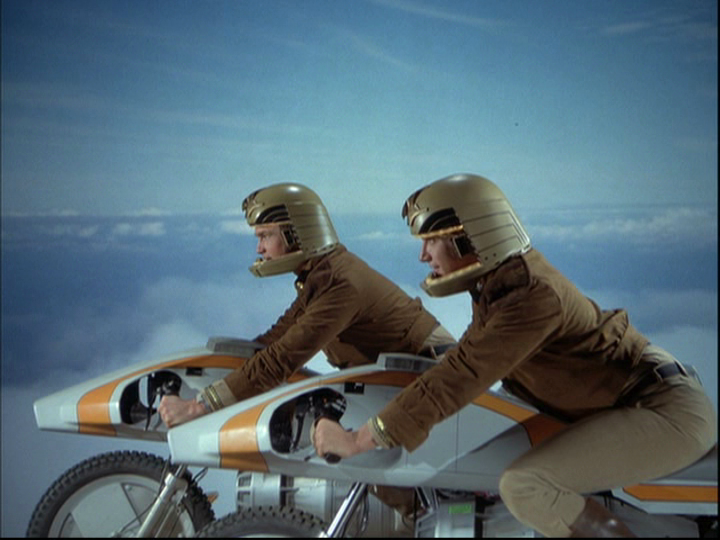 Galactica 1980 is largely considered to be one of the worst shows in science fiction history. Partly because it was an inferior knock off to an already critically disliked TV show, but mostly because it was an extremely inferior knock off. 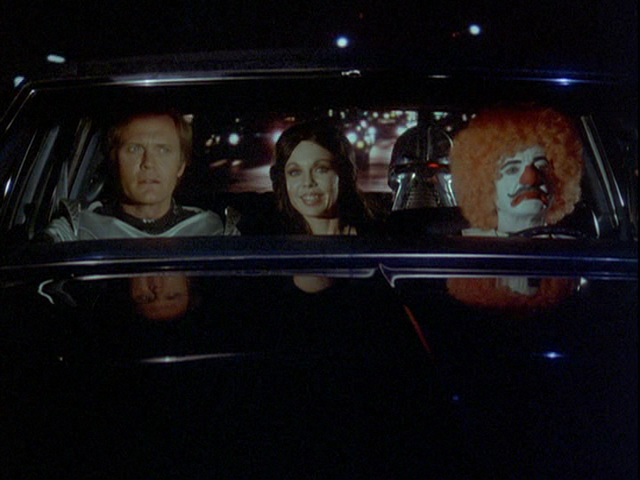 Almost every character from the original series is written off as having died during the journey in Galactica 1980 because the original actors couldn't or wouldn't sign on for this version. This is a severe blow for the fans to take, for suddenly out of nowhere we're robbed of any emotional involvement we may have had with those characters. Aside from sweeping changes in the cast and characters, sweeping changes are made to the premise. By and large, there's no reason not to consider Galactica 1980 canon with Galactica 1978. The two shows are meant to be the same and do not contradict each other. But many BSG 1978 fans take too much offense to BSG 1980, and arguably with good reason. Even moreso than BSG 1978, BSG 1980 is a kids' show. 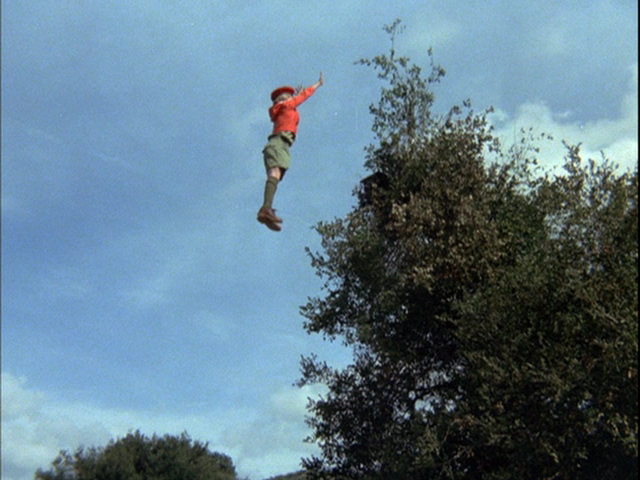 There are obvious attempts to sprinkle elementary educational value into various scenes, and children are featured as prominent influential characters, such as Dr. Zee and later the infamous Super Scouts. Moving on to the plot itself, if we forgive the sentiments of the day and their extreme influence on the story, the basic idea behind this story is actually pretty cool; I must admit, Galactica 1980's first episode is among my favorite episodes of BSG 1980, and one of the better episodes of both series. No, really. Think about it. The colonials and the Earth humans have the same origins, Kobol. The Earth humans just don't know it. And they also haven't developed the level of technology the colonials have. So the colonials send undercover operatives into Earth to swiftly influence the development of their technology and culture so as to prepare them for eventual first contact. Galactica 1980 had a really cool idea for a TV series! On that basis, my rating of this episode is very forgiving. Sadly, however, like BSG 1978, BSG 1980 is not true to it's pilot episode and the quality of the series will begin to drop. - Dillon shooting down the rocket. - The little boy finding the Vipers again and this time getting the authorities to see it in time. - The little boy pulling pranks on his rival. - Colonial officer gives rank insignia to someone count 4. Troy gives rank insignia to Willie. - Xavier walking into the street almost getting hit by car, then mistaking a police car for a cab. - Xavier meeting with Mortinson. And BSG 1980 begins to run out of steam right here as plot devices introduced in the first two parts are exploited beyond capacity. There's nothing too fundamentally different in this episode from the previous two, except that it accomplished nothing short of wrapping up the cliffhangers of the previous two episodes. It even largely fails to do that, seeing as how Xavier has escaped. The episode then leaves us with yet another cliffhanger, of the pseudo sense, showing our brave new heroes ready to take on yet another time travel adventure, except this one takes place offscreen. I suppose even the writers were tired of time travel by this point. What's most annoying about this episode, besides of course the all kids' show padding the network enforced, is the sheer pointlessness of it. It completely fails as a conclusion the grandiose things presented in the first part. Adama et al don't appear to have a clear, well defined plan by the end of the episode. They've only barely (and arguably not completely) recovered from an initial blunder. What way is this to start a series that's supposed to be about one culture artificially enhancing another? In place of philosophical exploration of that concept, we learn instead more varying gradeschool facts about Earth. How disappointing. I didn't really follow, but how did Xavier's Viper get captured? Was he that stupid that he landed it next to the other Vipers (how could he know where they are? ), while they are chasing him? And it managed to become visible at the same time as Troy's and Dillons'? - According to one of the Super Scouts, there are 114 billion stars in the Milky Way galaxy, which is supposedly information derived from Galactica sensors. - The appearance of the new Cylon ship. - Flight attendant: "Smoking or nonsmoking?" Dillon: "Which way does the plane run best?" - The Cylons mistaken for Halloween costumes. - The disclaimer at the end... "The United States Air Force stopped investigating UFOs in 1969. After 22 years, they found no evidence of extra-terrestrial visits and no threat to national security." WTF? So the Cylons have created human models. 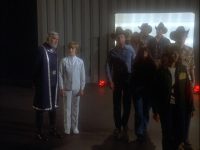 Now there's an interesting plot development, but true to Galactica 1980's style, it's exploited for comical value rather than its serious implications. Indeed, this episode makes for a pretty good showcase of why this series is so hated. 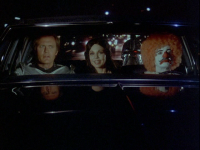 It's filled top to bottom with cheesy late 70s / early 80s comedy; even viewing this episode back in 1980 would have been a bizarre experience. We do, however, get to see a new type of Cylon ship in this episode which looks pretty cool. And I concede an extra point for this episode's strangely effective, though perhaps unintentional humor. - So why did the colonials never discover that microwaves have a deleterious effect on Centurions during the Cylon wars? - The humanoid Cylons seem to have a telepathic power, as Andromus was able to convince the Taxi driver that he had already paid, Jedi Mind Trick style. One wonders what the limit of this power is. 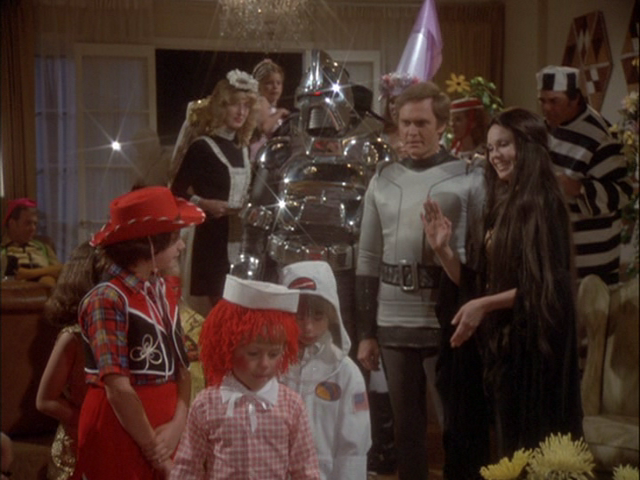 - The Cylons at the Haloween party. - The Centurion collapsing from the radiation emitted by the microwave. - The people from the party mimicking the Centurion: "Voom... voom... voom..." Hilarious. - The damaged Centurion picking up his injured comrade and walking off the roof of the building with him, falling into the dumpster. The farce ends with as much silliness as the first part. Again, strangely, the humor at the Halloween party among other places is strangely effective, making this episode like the previous one at least somewhat entertaining, in a "don't take it too seriously" kind of way. Beyond those merits, there is very little to redeem this episode. Yet another blundering incident on Earth is barely cleaned up by Troy and Dillon. Yet again the Earthlings remain barely oblivious to the actual events taking place. And what's the deal with that UFO disclaimer at the end of the episode? Do the writers really believe that after watching Galactica 1980 that people were really going to start fearing the prospect of UFO invasions? - One wonders if anyone will ever investigate Hector's vastly unnatural overproduction of food. One also wonders if anyone will ever notice all that extra food doesn't seem to be going anywhere... on Earth anyway. - This episode is largely considered to be the worst episode of any BSG series. - The Cylons attacking the fleet and taking out the agro ships. There's nothing worse than a "cowboys, farmers, and hicks" episode on a science fiction show. Similar to BSG 1978's "The Magnificent Warriors" the issue of a food shortage is turned into a silly farce. Indeed, most BSG fans consider this the worst episode of BSG ever done. I'd like to take a moment to point out that no episode of BSG 1978 or 1980 is deserving of a zero rating in my opinion. In my Star Trek reviews, you'll note that in the vast majority of cases, zero ratings are only dished out when an episode is so bad that should have to be dropped from canon to preserve continuity's integrity. That said, this episode is no exception. "Space Croppers" may be annoying and bad, but there's no reason to drop it from canon just because it lacks taste. In fact, it's pretty pivotal to the aborted arc. Now that Galactica is incapable of producing its own food. Dependence on Earth is a certainty. The next logical step after this episode would have been a Cylon attack on Earth. Granted, Dr. Zee claimed that wouldn't happen until 1990 and it's been said that he's never wrong, but it's at least plausible that he was merely speculating. For it seems clear that the Cylons are bearing down on the colonials. - While many BSG 1978 fans despised BSG 1980, this episode is largely considered to be an exception to their collective assertion that BSG 1980 is not canon. - This episode was an attempt to save this series from cancellation. A sequel called "Wheel of Fire" was planned, but the last ditch effort to save the series failed; the series was canceled. - Starbuck battling the Cylons, crashing into the planet, and discovering the crashed Cylon figher he shot down. - Starbuck deciding to repair and revive one of the Cylons. - Starbuck reviving a Cylon. I loved the Cylon's reaction to seeing Starbuck. - Starbuck: "I don't believe this. How do you hurt a Cylon's feelings?" - The Cylons landing on Starbuck's planet. - Starbuck launching Angela and Zee into space. - The Cylons attacking Starbuck. - Cy shooting his own kind to save Starbuck. 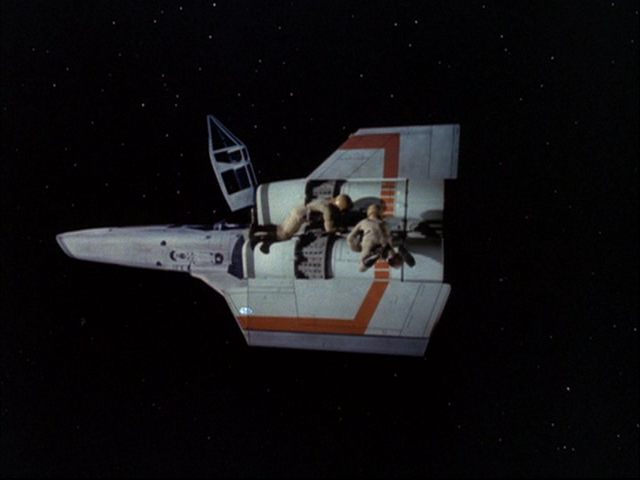 An episode depicting how Starbuck was lost. This is a welcome change of pace from Galactica 1980's usual repertoire. 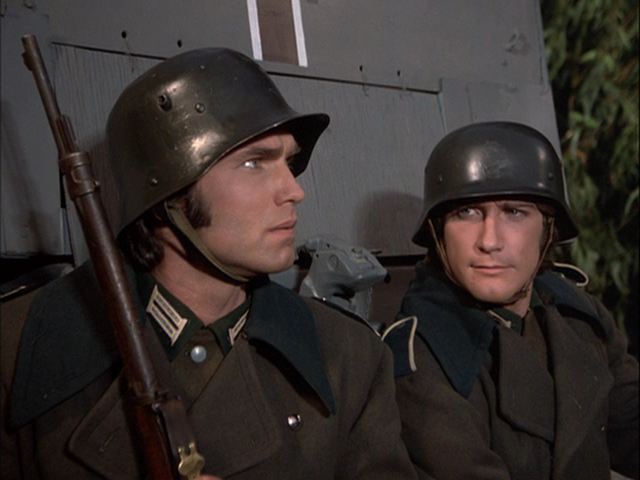 This flashback into BSG 1978 makes it clear just how much better the original series was compared to Galactica 1980. It's a shame we couldn't have just had BSG 1978 season 2 instead. Listening to Starbuck narrate his own fate was a very nice storytelling technique and the story of the events which befell Starbuck, Cy, Angela and her baby was most touching. 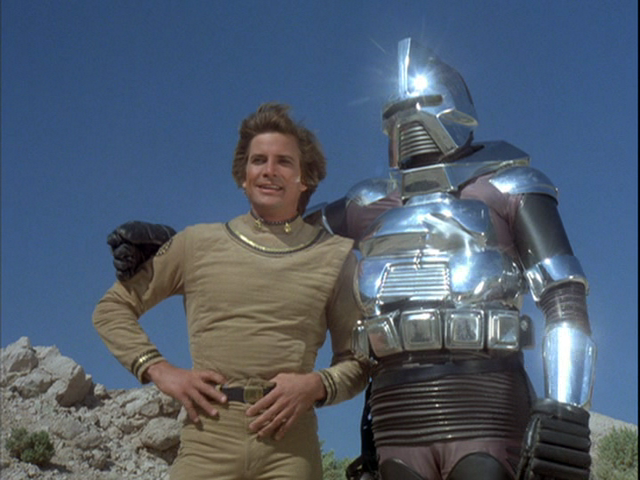 The idea that a Cylon Centurion could be turned and learn how to be friends with a human is fascinating; it tells us that they are something more than programmed killing machines. Or at least that they had the potential to become something more. BSG 1978 and 1980 similarly had the potential to become something more and that potential was never tapped. But like BSG 1978's "The Hand of God," I couldn't think of a better way to close a series. 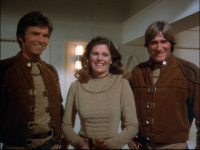 "The Return of Starbuck" was Galactica 1980's best episode, and what better way to close a series than on its best episode.